I had so much fun with the Alison swimsuit for my daughter, that I just had to make another one. I did promise her a two-piece, after all! Swimsuit sewing is one area that you really can save money by making your own. For the same price that I would have paid for a single swimsuit at a 40% discount, I got enough fabric and supplies to make two. And they both fit my daughter, a feat that the department store is unable to accomplish! Instead of using the flat neckline of the Alison pattern, I sculpted the front for more of a sweetheart and added elastic. I'm not sure that elastic is necessary -- my thoughts were that it was a deeper neckline, and it would add a little "security". Used firmer bust cups in this version, although I still had a hard time finding the best size locally. The bottom was super easy, as I just used the bottom 8 inches or so of the Alison and added elastic at the waist. It is in the navy/white polka dot fabric. I also lined the bottoms with swimsuit lining (the one-piece was lined only in the crotch and bust), which apparently made it more comfortable, as well as less transparent when wet. Although I did not notice any "problems" with the original unlined torso of the first suit, which she wore on vacation at a water park. Unfortunately, I don't have any pictures of the briefs, because my daughter left for college, taking the suit with her! I'm told "it is perfect." It was worn on a float trip and for bluff jumping. I'm glad I didn't know about the latter until after-the-fact. Suit #3 was a "pageant" swimsuit. I don't have any pictures to share with her in it, as she doesn't want those on the internet, and she's probably right. Let's just say that it really accentuates her positives. I had a hard time dressing the mannequin. The bottom would just not go on easily! We ordered some vibrant raspberry spandex from Spandex House several weeks in advance, but two days before the pageant it still hadn't arrived, so we bought more of the red from Hancock and I whipped up a slightly different one-piece version of Alison. Lengthened the torso by about 2 inches, which better aligned the bust of the suit with her bust. She does not have a long torso, so I didn't even consider doing this with the first version. Bought some power net that we considered using, but instead just used regular swimsuit lining turned so the direction of greatest stretch ran lengthwise instead of crosswise, which gave surprisingly more support than I anticipated. It looked great on her, and I saved $200 from the price of the least expensive pageant suit that I could find. Back: It really is straight, and yes, I stole Tilly's Bow Back Nettie idea! For these two suits, I used only my Bernina 930. My serger doesn't do a cover stitch, so rather than switch back and forth, I kept it all on one machine. I used one of the stretch stitches on the two-piece, but only the regular zig-zag on the third suit, which I think I liked best of all. Stephanie begrudgingly participated in the county pageant, as a condition of getting some money for college from my dad. His intention was for her to build confidence -- which it eventually did. 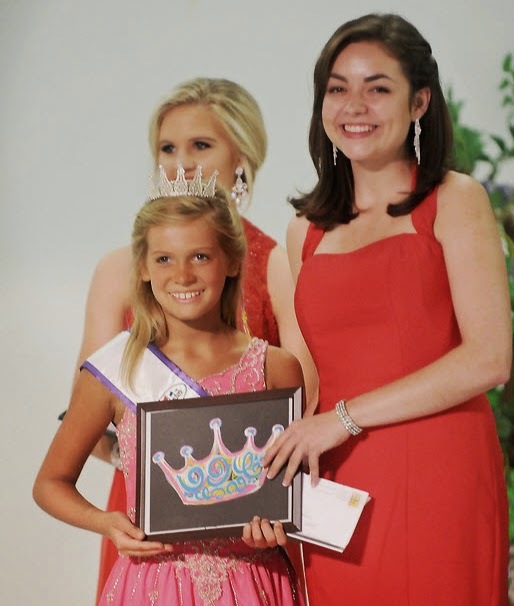 She won Crowd Favorite and Spirit of the Community awards (and second runner-up). A huge shock to her, after hoping that "they don't announce last place." She also met a lot of super sweet girls who gave her some great advice, since it was her first pageant (and most likely her last). She really dragged her feet to prep, and the day before the event, she found out the loaner gown she had lined up was not available. Instead, she wore this year's hand made prom dress for her evening gown. I was a little concerned that it didn't have any bling, but she fit in just fine with the older age group (surprisingly, the younger ones had the flashier dresses). The event symbolized the end of an era for us, since she left for college the next morning. It was a great send-off, especially when she saw a blue ribbon on her gluten free cookies! She was afraid she'd get last place on those, too. At the Best of Show case.